Falling Kingdoms is told from the perspective of four young people from different kingdoms whose destinies intertwine during the brewing war between the lands. I'll admit right of the bat that these character aren't completely likeable. Despite that though I did like (most) of them. Why? Because they were flawed and went through a lot of growth as the book progressed. Rhodes has done a brilliant job of pushing these character to their limits, having them make tough decisions and face their destines head on. Normally I'm not a fan of multiple POV's, but their individual arcs flowed seamlessly together and each voice was distinctly different from the other. Cleo - Out of all the characters Cleo is the one I least got on with. She was meant to be portrayed as fiery and stubborn, but most of the time I found her to be spoiled, reckless, and, whiny. She's so used to getting her own way that when denied something she foolishly goes and does it anyway, not fully thinking about the consequences of her actions. And towards the end of the novel when she finally does get some sense knocked into her it sadly comes at a very high price. A trait of hers that I did like, however, was her devotion towards her sister and her friends. Jonas - He's clearly the under-dog and I really enjoyed his story arc. His brother is murdered by a royal from another kingdom and through his blood-lust for revenge a revolution begins. Magnus is by far my favourite character out of the lot. He cares deeply for his sister Lucia and will do absolutely anything for her. This loyalty runs both ways. However, after discovering that his love is unrequited he grows closer to his father - a cruel and manipulative man who enjoys conflicting pain on others. It's much easier for him to put a barricade around his feelings than to feel hurt, so he becomes the prince of ice, and his father's greatest weapon. But, buried deep within him there is still some good and I can't wait to see where Rhodes take his character in the sequel. Lucia - Even though we're not in her head that often compared to the others I felt most connected to her. She loves to read and soak up knowledge, something I think us book lovers can relate to. As she struggles to figure out who she is and why strange things keep happening to her, she discovers some truths about her past that shock her and isn't sure how to handle it. At times I wanted to shake her because she was so naive. She never questioned anything and accepted things way too easily. I have a feeling that she'll play a larger role in the sequel, so I hope we get more of her perspective. Four different POV's? taht sounds a bit confusing... but still very interesting. Love that quote. So true. :) thanks for the review! This one was new to me. I love it when books alternate the point of view! Great review! You had me at "Game of Thrones" - I just finished watching the first season last night and I'm hooked!! I'm a huge fan of Game of Thrones but unfortunately I didn't enjoy this book as much as other readers did. Still . . . there's plenty of people who loved it. Great review! Oh I didn't realise this had a split narrative! It sounds pretty well done though and I'm glad to hear the characters grew throughout. You also have me convinced at the mention of Game of Thrones. :) Wonderful review, Renu! Oooo I think Magnus is going to end up being my favorite of the four as well Renu! I can't get enough of the really dark and damaged characters, and the fact that he's encased himself in ice has me wanting to pick this one up immediately to see if I can glimpse a thaw here and there:) Really looking forward to this one! Four POVs sounds absolutely interesting! Thanks for sharing the quote, I love it! :D Great review, Renu! 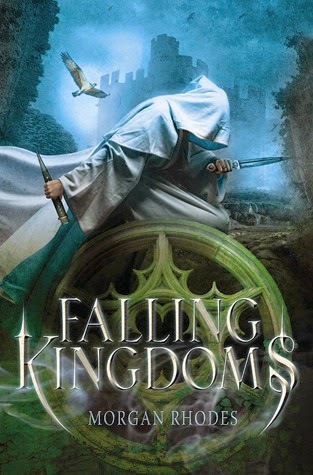 I will definitely check out Falling Kingdoms. I like the show GoT and I enjoyed Throne of Glass... a winner for me you think? I'm usually not a fan of multiple narrative perspectives, but it seems as if each character in this book offers something fascinating to the book. I'm under the impression that Cleo is a piece of work and I can certainly tell that she is a character I'll loathe, but Magnus sounds like an enigma and very intriguing; Lucia and Jonas sound quite sweet. :) I'll have to give this book a shot as some point! Great review, Renu! I've heard a lot of great things about Fallen Kingdom. I had no idea Rowen wrote it. Glad you enjoyed! Nice review! Nice plugin – I will definitely be using it in my Blog. Good efforts. All the best for abutting posts. I acquire bookmarked you. Able done. I apprehend and like this post. Thanks.